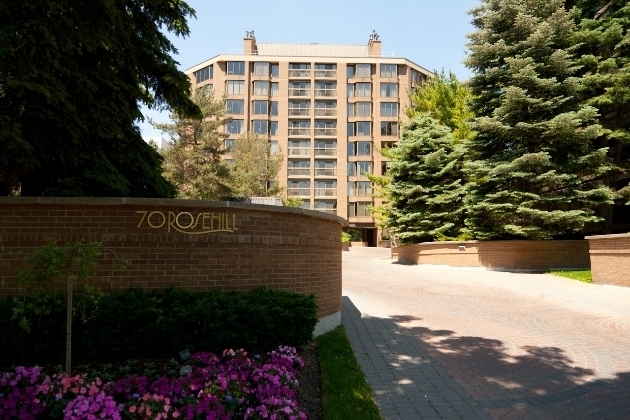 70 Rosehill condominiums are 2 bedroom, 2 bedroom + den or 3 bedroom layouts. The den can be converted into a third bedroom or used as a personal office space. Suites have lovely dining rooms, two bathrooms and huge terraces. Many suites enjoy a beautiful and unobstructed view of the Toronto skyline. There is a direct elevator to each condo. The facilities provided by the building include valet parking, 24-hour security and concierge and an indoor pool. Two parking spots and a storage locker are also available.